This is a continuation of my previous work on Mushrabiya Screens. 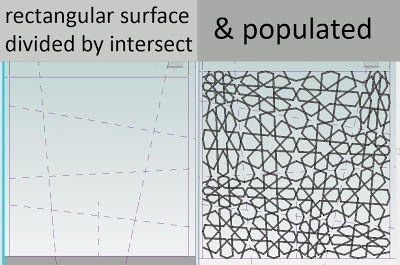 It was prompted by a query from an experienced Revit user in our office who was looking to do a scaleable pattern with variable "member sizes". 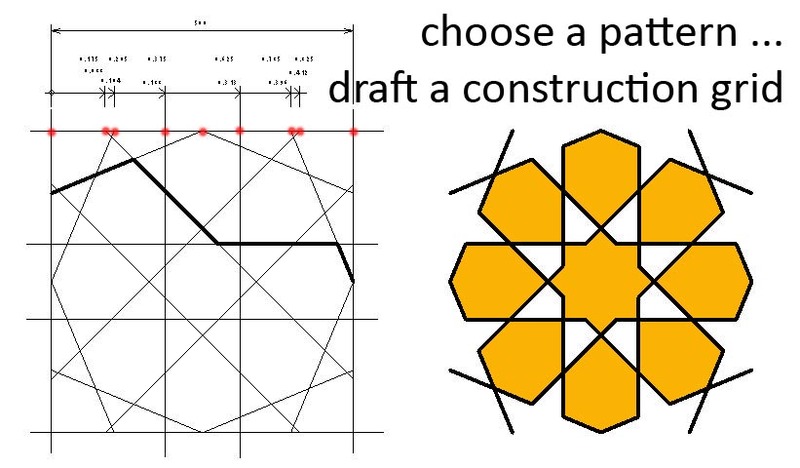 First of all you need to choose your pattern and draw it, probably in a drafting view. Sometimes it helps to trace over a jpeg image. 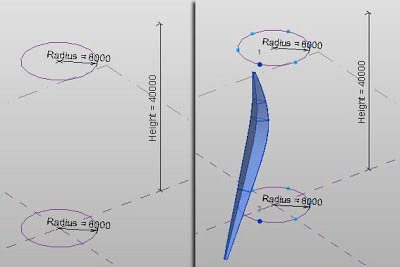 You need to think in terms of construction lines, which usually means extending the pattern through to the edge of a bounding rectangle. The goal is to identify the points where the construction lines meet the boundary. You need the spacing of these points, expressed as fractions of the boundary side. 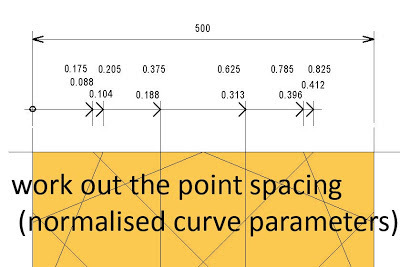 These fractions will become "normalised curve parameters" in a curtain panel family. Open up a "curtain panel by pattern" template in family editor and place points along the boundary. They should be hosted on the reference lines. 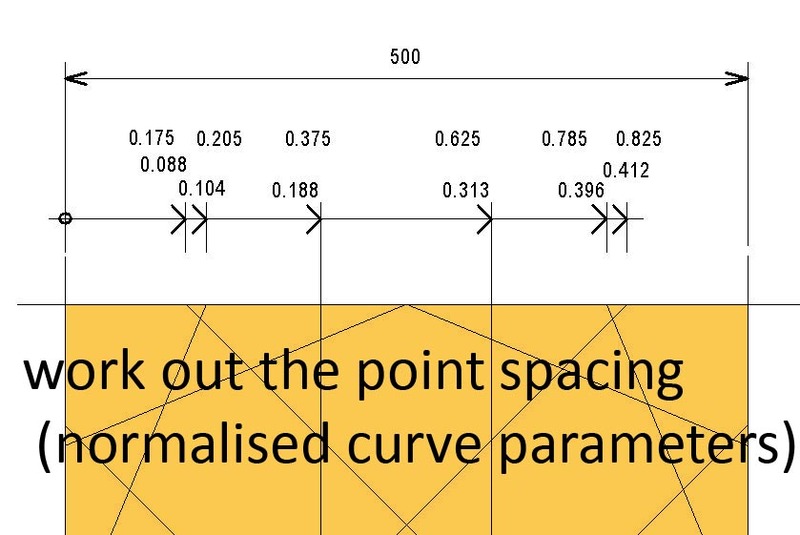 Select each point and give it the desired "normalised curve parameter". Takes a while, depending on the complexity of the pattern. 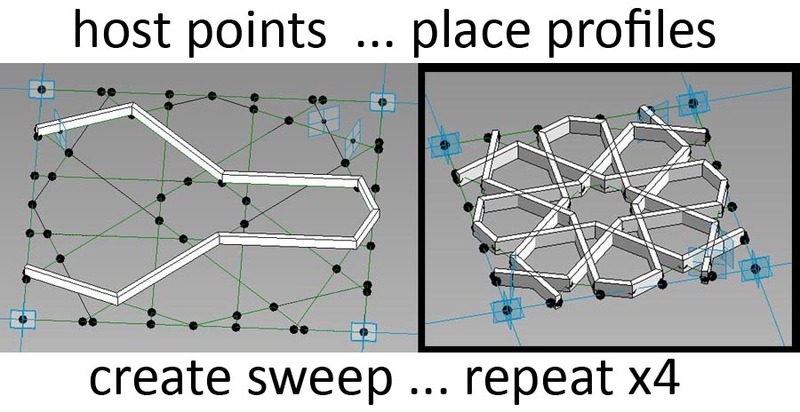 Now connect these points in pairs to recreate the construction grid. Convert this grid into reference lines, and add more points. Select these new points, one by one and "host by intersection". You can now duplicate the default plan view and rename it. I named mine "no ref lines". Under visibility graphics, turn reference lines off in this view so you just see the points. Now you can creat the original pattern using model lines. Choose pairs of points and join using "spline by points". The customised plan view really helps you to see these new lines clearly without the confusion of the construction grid. 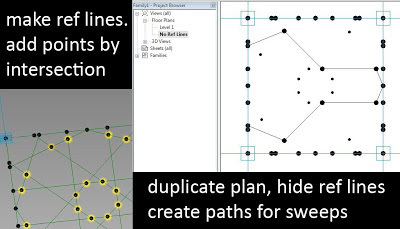 In my example I have 4 paths, each consisting of a chain of 8 lines. I host a point somewhere on each chain, make it's work plane "visible always", set this as the current work plane, and place a mass profile. 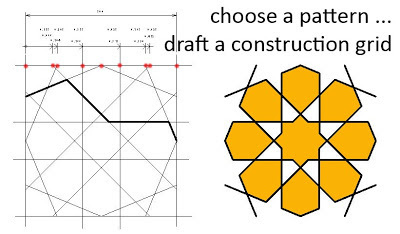 Select path and profile: create form. Repeat for the other 3 and you have a curtain panel. New family. Draw a rectangle in an elevation view. 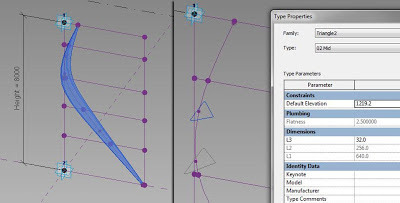 Add parameters for Length and Height. Change the lines to ref lines, select the loop and create form. 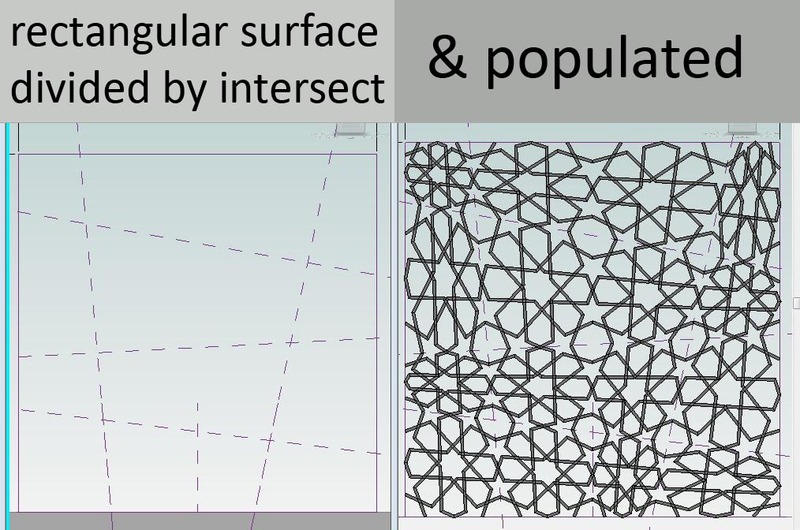 You get 2 options (surface or solid) choose the surface. Select the surface and divide. Load the curtain panel and use it to populate the surface. You can create parameters to control the number of cells in U & V directions. In my case I used the same instance parameter for both directions. Load this family into a project and place several instances. Vary the pattern scale with ease. Next I added an angle parameter, again the same for both U & V. This rotates the pattern within the surface. My next idea was to use "divide by intersect". I did this in family editor to create a surface divided into very irregular quadrilaterals. The panels adapts to these shapes without a murmur. Looks a little crazy but maybe that's what you want. Back to the previous divided-surface family and I added a label for the embedded curtain panel. Now you can load several different panels and swop them in and out. I also have parameters to control the mass profile used in the sweeps. Now from inside family editor you can select individual panels and adjust how "heavy" the members are. I dredged up some of the previous patterns I had made. I was a bit lazy at the time and used circles for the sweeps, so I went back and replaced these with nested profile families and gave myself the option of switching between circular and rectangular sections. 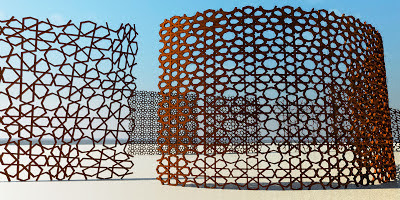 Now all the preparatory work is beginning to pay off and I have a highly parametric mushrabiya family. So I packaged it up as a little christmas present for all my faithful readers. I am off on holiday now so may not be posting until the new year. Why am I so hooked on puns & double-entendres in my blog-post titles ? OK so it catches the attention, & hopefully starts people off in a jovial mood, but I don't think that's really it. Arthur Koestler, in his classic book on creativity suggested that humour, artistic inspiration & innovative science share a common thread based on the unexpected justaposition of previously unrelated ideas. Charles Mingus had a trick of asking musicians to improvise in unfamiliar keys, throwing them off balance and creating a tension in the music. Why call an annual conference a university ? What is a university anyway ? Are you hoping to gain the latest tips & tricks, or to market yourself and your products ? Is everything pre-arranged to run like clockwork ? Shouldn't it be more of a challenge ? Hey You ! What do you think the real problem is ? I've been watching some of the videos from Las Vegas, drinking in the atmosphere, skimming through the feedback from some of the attendees. Also reflecting on the aftermath of our little event here in Dubai, the motivational effect on the group we sent along from GAJ, the value of having to work up and rehearse a presentation. There are some negative responses out there to big Carl "going on about the cloud again", but for my guys on the ground out here it was an eye-opener. There are always problems when your mind races on ahead of your body. It's easy to "get" the cloud and race ahead in your imagination, but until thousands of people have banged their heads against the daily realities for a couple of years, BIM 360 will remain another of those cute little futureful videos that seem to be so popular these days. The message in for me is "I have to start using it as a Bread&Butter tool" Then we'll see where we are in 12 months. We have to be in for the long haul AND ... wait for it ... the good old US of A has to start making room for the rest of the world. WHAT ?!*? ... What do I mean by that ? I am inspired by what Autodesk are doing, and by the "democratisation" of design-build that is being imagined and pioneered by people who grew up with computers in the urban centres of "the west". But there is a slight unease at the edge of my mind as I watch those keynote presentations, and there are two elements to it. Firstly it's the taking for granted of "innovation and growth" as unquestionably positive values. I am no luddite and I'm certainly not scared to re-think the wheel from time to time, but I also like to pause for breath. In some ways we have become "change junkies". As a species we evolved a way to disconnect adaptation from it's biological constraints. 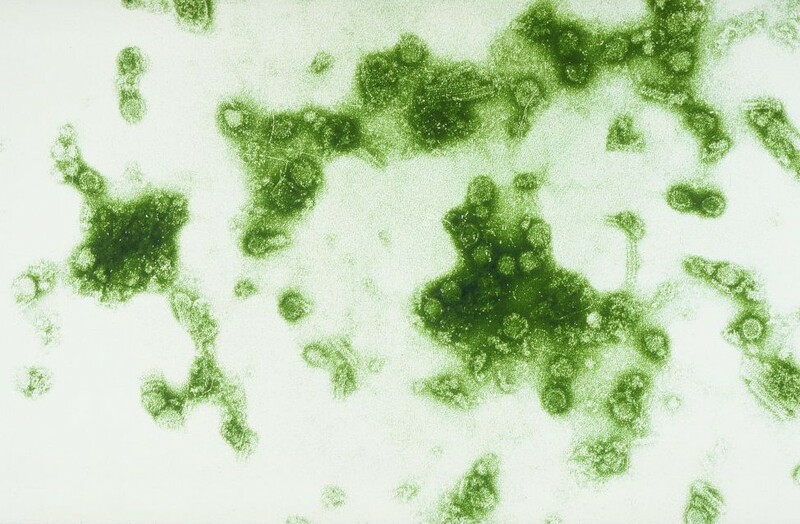 Call it culture if you like, but we have also been compared to a virus, or a weed species. We invade new habitats, grow faster than everything else and then ? Biology predicts a population crash at some point. We all know this stuff. So what ? I don't have all the answers, but I think that we need to look for a balance. There is a danger in hyping it up all the time, looking for the next big thing, out-guessing the competition. What about quality of life. What about the wisdom of the past and the rich cultural heritages that we keep sweeping away in our haste to innovate ? Which brings me to my second point and back to where I started. AUX in Dubai was a simple, home-made affair. It was very different from the main event because culturally the Middle East is a different world. Hardly a day goes by without an opinion piece in our newspapers suggesting that the USA needs to listen to what the Arab world has to say, to try harder to understand, to adopt a more responsive policy, etc etc. It's a little formulaic, but all the same there is some truth in these sentiments. 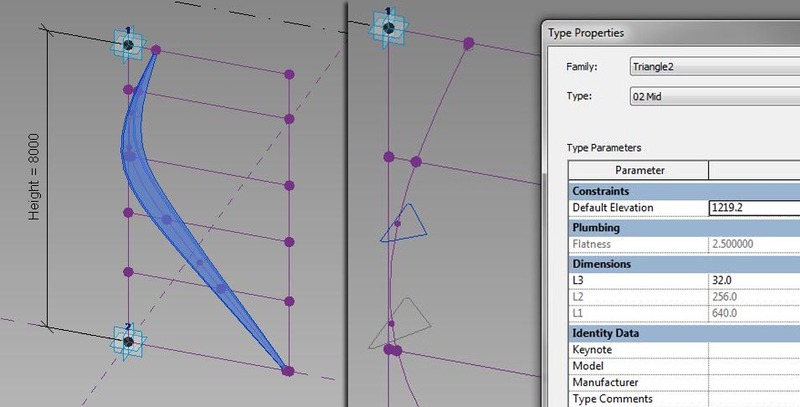 As a long time autodesk software user, I have often felt that, what's the correct word ? We talk of Eurocentric, and we have "Americanisation". What is the word for the way US companies do things their way and hardly seem to notice that the majority of mankind face a different reality ? I don't want to sound negative here. My blogger map is dark green in the top left corner, with a few patches of pale green and lots of white everywhere else. Two thirds of you are following me from the states, and it is not my intention to offend you. I do think it is in your best interests as a nation to think hard about leadership. Don't all the great american leadership gurus tell us that good leaders listen and guide ? I'm not an expert on that stuff, but I've a feeling it goes something like that. Inspire your workforce, delegate, let them blossom, and LISTEN to what they have to say. A little research has established that there were 3 AUX events this year: Dubai, Joburg & Mexico City. Lynn Allen was the keynote speaker in 2 of these, I didn't establish who took that role at the 3rd, but I suspect they were fluent in Spanish. Lynn was great and I am kicking myself now for not being more aggressive and introducing myself. I almost picked up the courage to gatecrash the Autodesk table at lunch, but then our local agents came up and asked me to join them. No big deal, but it brings me back to the main event videos. There was just this little nagging feeling in my mind that it was so ... American. "The kid was great", of course I agree, but why a precocious young American who has 2 computers, a tablet & a smartphone. Why not a Ugandan who walks 8 miles to school every morning in bare feet. Surely that would be a much more accurate picture of the typical 21st century 10 year old. What story would she tell about the democratisation of making stuff ? Perhaps she makes the most amazing wire toys to sell to tourists, or possibly cuts up used tyres to make sandals. I'm just throwing that out there. BIM is about collaboration and integration. It's about a global industry finding a way to do things more openly and transparently, more intelligently and responsively, more sustainably and responsibly. Autodesk and the community of enthusiasts that they nurture have made a huge contribution. I applaud them, and I'm inspired by the challenging ideas they constantly generate. In my view they have done a fantastic job of setting up networks, employing strategists, conducting research projects and predicting trends. I just hope they are starting to ponder the need to "open up & let go" to find ways to "de-Americanise" technology. It's not a slogan. It's a very deep and difficult mission, and hugely important if humanity is to survive another century of "progress"
I met Phil Bernstein a couple of times some years ago and he always has something interesting to say. I enjoyed his illustrations of drawing techniques from the past, it's a topic that also fascinates me. But was he saying the same thing as "the kid" but in a much more nuanced way ? Were the designers of the past (Leonardo/Alberti) limited by the technology available to them ? In an obvious and crass way the answer is yes, but I can't help wishing I shared those limitations. Of course Digital Prototyping is a revolutionary new approach and BIM is much more than just another drawing tool. But on the other hand, what do you mean "just drawing". Was Leonardo "just drawing" when he traced the circulatory system of the human body ? Drawing has been a huge part of my life. It's fundamental to the way I think, and Revit has joined the pencil as my "tools of choice." For me, drawing is all about understanding. What's the slogan ... Learn, Connect, Explore. The main reason I'm hooked on Revit and BIM has nothing to do with ROI or clash detection. It's a better way to draw. And drawing has nothing to do with lines, arcs & circles. Leonardo wasn't thinking "now I'll draw an arc". He was exploring how the human body works. He was thinking, "I wonder why we are made like this ? ", and his hand, eye and brain were working together seamlessly to explore the possibilities: connected, to explore and learn. I am hooked on Revit because it's a great drawing tool. I have pencils and paper scattered all over my desk because they are also great drawing tools. I used to lay bricks with a trowel & a spirit level. They are also fantastic tools and I wish I was still young and fit enough to go outside and build walls. I'm not very excited by digital printers to be honest, but I'm sure they can also be used to think with. Let's embrace new technologies, but let's not sweep the past away without a care. Automation is NOT always better. I experimented with computer aided music for a while, but in the end it felt sterile. Music is a social art, it's about emotions and interactions between people. Live music. Two words capture it. Charles Mingus understood that. How do you tell a computer to play in an unfamiliar key ? So the internet generation of the West is charting an interesting course, but they had better be aware that they don't own the future of the world, nor do they have the right to erase the past. If they truly want to be connected they need to factor in the youth of Africa and set their minds to the hard task of figuring out what is holding back millions of eager young minds and bodies from fulfilling their potential. It's not lack of American aid. How do we find our way from where we are now to a more equal and open world for all ? Can all those super-computers in the cloud figure that one out ? Perhaps we need to focus on People and Teams, but within a much broader context. So Hey You ! What are you thinking about ? How can we make the world a better place ? Those are the kinds of question that the word University conjures up for me. 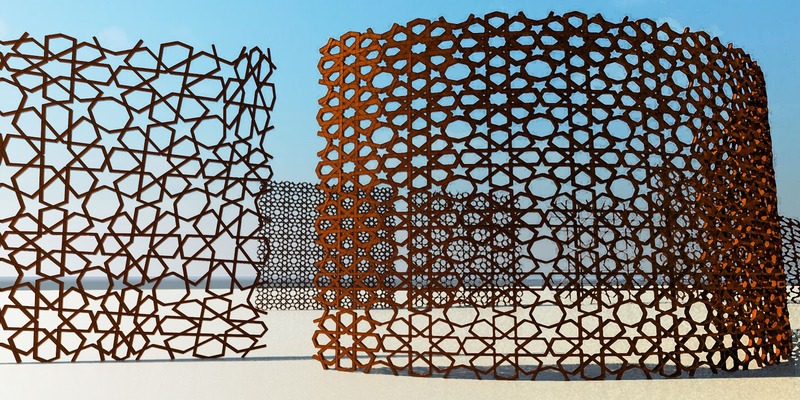 Looking forward to presenting tomorrow morning at the first ever Autodesk University Extension to be held in Dubai. Kudos to Omnix International for organising this event. I always used to say that Architects are people who can see the wood from the trees. Clarity of thinking is crucial. The idea of "massing" as it has been understood by architects for centuries, is to strip away the irrelevant detail and isolate the key volumes. Early concept sketching is no different. Whether you use a pencil or sheets of cardboard matters little. The question is, can you capture the essence of the design problem. We tend to take "sketch mode" in Revit for granted. It's just a technique we use while documenting a project. But actually it's a good example of the abstraction process that is critical to early design. This is the way I think about the Conceptual Massing Environment, and it's the core of my presentation tomorrow. We need to use these BIM tools as we would use a rapid pencil sketch or a quick mock-up model. There should be a fluency that allows the mind to focus on analysing the design issues. The "digital cardboard" programmes that dominate early design work at present are all very well, but BIM tools offer a whole other dimension which needs to come to the fore. Most of my presentation will be in the form of a series of short, live demonstrations: a whistle-stop tour of things you can do with Revit Massing. I will touch lightly upon pumpkins & spring onions, but the main focus is on buildings or at least, simplified abstractions of built forms. I fully intend to convert these demonstrations into posts over the next few weeks and also to make more videos available on-line. There have been several requests for this and I must get around to doing it. The title is taken out of context (as usual). The cathedral of light was a display organised by Albert Speer for Adolf Hitler, searchlights forming vertical columns of immense height in an open field at Nuremberg. But light had played a prominent role in the history of cathedrals for hundreds of years before those chilling events took place. One of the major themes of Gothic architecture was the dissolving away of structural walls to allow dramatic effects of light. Oscar Neimeyer was an atheist (apparently) and an immense figure on the architectural scene when I was a schoolboy. He participated in a project that aimed to launch Brazil into the modern world, a surge of belief and idealism backed by massive social inequality and authoritarian politics. Much could be said about the naivety & the inherent contradictions, the contrast between the purism of the forms and the squalid living conditions of the workers who built them. But to some extent these contradictions are inherent in civilisation. We all participate in a game of inequality & if we are designers of dramatic forms, believers in originality and vision, we would do well to reflect on these contradictions from time to time. This post began as part of my Vasari Talk. Towards the end I showed some images of architectural examples based on the spring onion wig hat. One of them was the Cathedral of Our Lady Aparecida, Brasilia. I tried to imagine that I was designing this building using Revit as a tool. Let's pretend we haven't yet decided how high the building will be, how many columns there are in the circular array, what cross-section to use, etc. Indeed I began the experiment without these facts to hand. The rig is loaded into a mass family which has two circles placed on different levels. A height parameter controls the distance between the levels. Divide the circles (6 nodes appear on each) and attach the adaptive component to one point on each circle. Select it and hit the repeat button. From here we go on to link all the available parameters to instance parameters in the host family and load the result into a project. The result is a form that you can copy around and vary to your heart's content. The variations shown here are extreme, but the real benefit of this method comes from the ease with which you can make those endless small adjustments that turn a promising idea into an elegantly proportioned design. For example I spent some time in the adaptive family adjusting the shape of the spline. Originally it was a continuous curve, but this didn't look right, & so I straightened out the legs & confined the curve to the "waist". Revit has a reputation as a documentation tool that you can't use for "design". My stock response is that no tool is good at design until you have reached a certain level of fluency. Pencils are great for design, but we sometimes forget the hundred of hours spent honing our sketching skills. 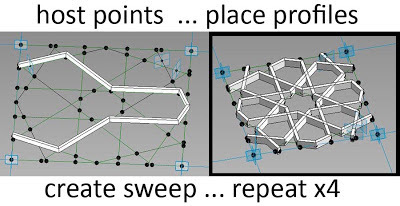 Once you reach a certain level of fluency, the conceptual massing environment in Revit is a great design tool, combining power, precision & flexibility. You have to pay your dues to get there of course, but what did you expect: something for nothing ? That's as far as I've got. Some day I will add glazing and a sunken floor accessed via a tunnel. I wasn't suprised to learn that the building overheats and has terrible acoustics. Apparently it has rarely been used, but there is talk of refurbishing it to overcome these practical defects. I wonder how I would have designed it to avoid the shortcomings without destroying the purity of the form. Download the repeater family from the link below.